Accepts business or personal-size checks. 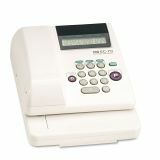 Max Electronic Checkwriter, 14-Digit, 3-5/8 x 9-5/8 x 7-7/8 - The simple, key-entry operation allows input of up to 14 digits plus symbols. Dollar and cent symbols, commas and decimals are printed automatically. 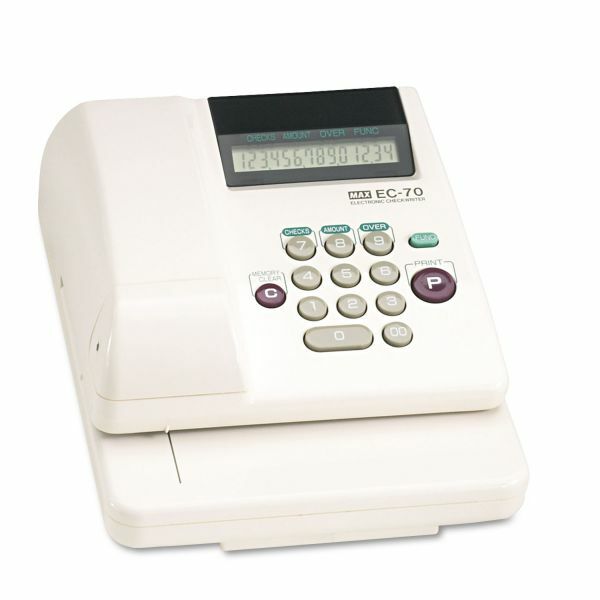 Electronic Check Writer prints original plus two carbons and features an area of up to 3-1/8 for processing checks and a LCD for easy-to-read amounts. Device accumulates total number of checks processed and provides total dollars of all checks issued. Void key allows the cancellation of an incorrectly printed check. Functions include printing, repeat printing, and correction by clear key. Check writer provides security from forgery with an embossed dollar and cent symbol before and after the amount to protect against altering the amount of the check. Check writer includes a black ink roll, operates on AC power and weighs 4 lb.